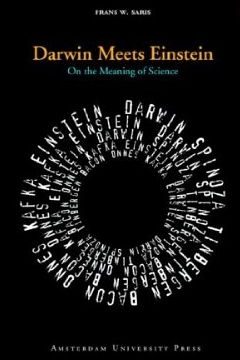 This book piquet my interest because I had no idea what Darwin and Einstein had in common (apart from both being very smart guys of course). And Frans Saris builds it up beautifully, and when the revelation comes towards the end, you go - why didn't I think of that?? The book is a collection of colums, diary fragments and essays plus one play, written over the course of many years. The author started his career as a physicist and gradually developed into a manager at universities, a nuclear research facility and the Netherlands' Fundamental Research Institute. In his latter roles he has been involved in getting research funded, getting to prioritize public science funding, and all the political angles that has. A large part of the book concerns itself with the question he has had to answer numurous times: why do we need science, why do we need unfocussed, free-loafing fundamental research, rather than research focussed on specific goals that lead to specific advantages or make money or whatever, but directly aimed at utility in some form. The eternal science question in fact. He then gives away his direction by asking the question from the opposite side: if fundamental research has no utility, why does it persist? Because, he feels, evolution (Hello Sir Charles!) not only works on biological traits in living creatures, it also works on culture and institutions. If fundamental research persists it must be because a society that practises it has a higher survival probablity than a society that doesn't. (By the same token, on a tangent he goes off of, he argues that religion has come into existence, and persists, because of its survival value for the human race. And to be sure, he does believe in a God - he believes in the God of Spinoza). For Frans Saris, the Theory of Everything is Evolution. Evolution, or more specifically the Theory of Natural Selection not only drives the physical development of living creatures but also everything else that impacts on chances of survival, be it languages, religion or, yes, the propensity (or not) of spending resources on fundamental research. That is, ultimately, the reason why we do it: to increase humanities' chances of survival. The play at the end consists of seven acts which each consist of discussions on a more philosophical level between, in order of appearance: Francis Bacon, Kamerlingh Onnes, Franz Kafka, Albert Einstein, Charles Darwin, Spinoza and Niko Tinbergen. The play has been performed several times by students of the Leiden University in The Netherlands, and it is probably one of the most intriguing parts of this book. It also shows that its author is not just an excellent physicist but also a great thinker about what we are, why we are here, and why we do the things we do. Recommended.